A great original pair of art deco chairs with fantastic shape and bentwood arms. A very relaxing and comfortable sitting position. These can be sold as they are and perfectly useable. They could be professionally cleaned or they can be reupholstered. This is a very nice original art deco Epstein walnut cloudback chair which has been reupholstered in fabulous deco period fabric so looks striking. 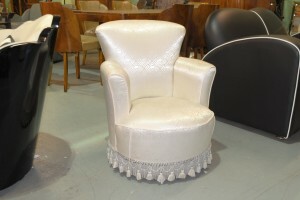 This individual chair will add that art deco touch to any room. 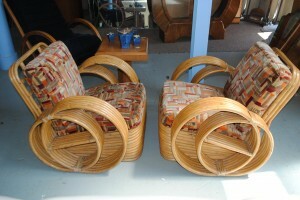 Fabulous art deco bamboo chairs with upholstered in stylish moquette and very unusual shape. 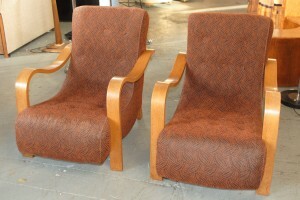 A fabulous pair of original art deco bamboo chairs upholstered in amazing art deco moquette. They are a super shape and in nice condition. For more details please call 01257 473688. 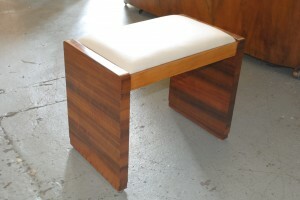 An original art deco walnut stool with cream leather seat. For more details please call 01257 473688. 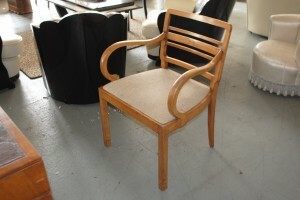 An original art deco chair in very good condition with lovely bentwood arms. For more details please call 01257 473688. 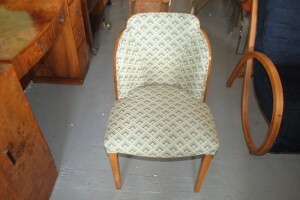 A very nice and comfortable pair of art deco chairs with bentwood arms. 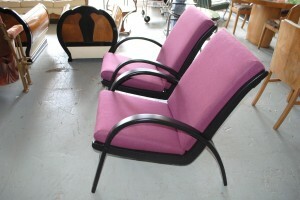 The black frame and purple wool fabric complement the stylish look and are in very good condition. For more details please call 01257473688. Original Art Deco Bedroom Chair nicely upholstered in lovely fabric with subtle design. 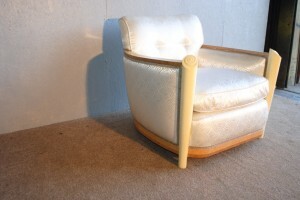 A comfortable original art deco bedroom chair upholstered in very nice fabric with subtle design. For more details please call 01257 473688. A very stylish original art deco cox & co chrome and black glass table with two re upholstered PEL chrome chairs. This is a very attractive set that came from the Rex Cinema Ballroom and Café which opened in 1936. A great bit of history to be re-told. For more details please call 01257 473688. A lovely shape and in good condition. It is upholstered in the most amazing fabric that is exclusive to Cloud 9 Art Deco so you will have a very unique art deco stool. For more details please call 01257 473688. 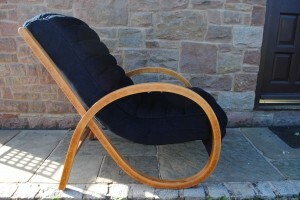 A fantastic original art deco bentwood lounge chair in excellent condition with navy fabric and extremely comfortable. For more details please call 01257 473688. 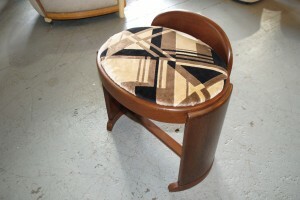 This is a fabulous quite rare art deco Maurice Adams chair with beautiful Birdseye maple and walnut . Nicely upholstered and ready for delivery. Simply stunning chair, very comfortable and designed by one of the best. Have you ever seen one of these before ? We havn’t and i’m not sure we will again. We love it. Sometimes i wonder just how they made such things in the 30′s. This is so well made and just beautiful. Now heres the thing, its in very good condition as it is and perfectly useable and you would be very happy with it at £3950. With a critical eye i can see a couple of small marks in the leather of one seat but are hardly noticble, however i know they are there. If it’s to be re upholstered then i would also refinish the beautiful veneers just to take it to the next level. 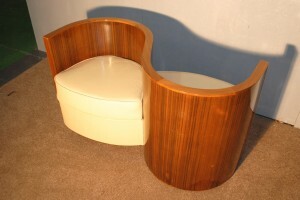 This will be an additional cost but i would like to see such a wonderful piece leave in the best condition possible.